I just got email back from Huion customer service, and guess what they say? ” Regarding the flickering issue when using the battery-free stylus, kindly note that we have forwarded it to our tech team. And they said it may happen on some large size of drawing monitor. Please accept our sincerely apology for the issue caused to you. Emmm…..what shall I say…..really, why they even release the large size pen display if they already knew that the problem is there? So it is a hardware problem that no one can fix it? Well, well, well. Be careful what you are purchasing. PS: I’ve returned the GT-191 pen display too because it did not come with a pre-installed screen protector. It drove me mad after trying to put on the protector flawlessly and finally I gave up. I don’t understand why they “forgot” to pre-install the screen protector on GT-191. All others that I’ve tried had it. Oh, my sweet lord…..
All right, I’ve been struggled with pen display, the drawing monitor lately. As I mentioned in my previous post, I bought Huion GT-191 V2 and thought it was a great upgrade. But no. That story was not a happy ending. I ended up return that tablet and purchased this GT-192 pro version, thought it would solve the problem I had. But no. Eventually, I returned both pen display with what so called battery free stylus pen. The problem I had is that there are horizontal lines flickering all the time all over the screen. At the beginning I though it was the cable thing. I tried unplugging and plugging, tried another HDMI cable and so on but it didn’t help. After I tried two different tablets with batter free pen from Huion, I realized that the problem is the stylus pen itself, or the monitor itself so to speak. When I put the stylus pen on screen and apply moderate to heavy pressure, the lines flickering more obviously around the nib area. When I release my hand the lines faded a little bit but still there. So if I constantly draw with some pressure, the lines flickering all over the place all the time. So far, this problem only happened on battery free stylus pen drawing monitor from Huion. I used to have Huion GT-220 v2 with charging stylus pen. It had no screen problem. As to the GT-192 pro pen display. Well, I do hope I can love and keep this one. It is a beautiful pen display. With 600 bucks you can get 19.5 inch screen, battery free pen, tilt sensitivity, bunch of hot keys. But, like I said, I can’t stare at the screen since I can always see those lines flicker like an old movie. I record a short video and post it on Amazon review. What is more, please be aware that I’m not the only one who experienced this. Here is another post regarding this issue. Since this is a fairly new product of Huion, there is not many posts online. But might be others would notice this soon or later. Actually, I am still glad to see that Huion does this battery free pen upgrade on their products. But I think they need some more time to figure this out. You see, Wacom has this technology decades ago, even VEIKK tablet has no flickering screen issue with battery free pen. The problem with VEIKK is the pressure sensitivity is not as smooth as Huion/Wacom. As to me, well, I feel I am back to where I started. Now I have to purchase the original version GT-191 with charging pen. I’ve compromised. If I have to choose between charging pen and flickering screen. I would rather use the charging stylus pen. 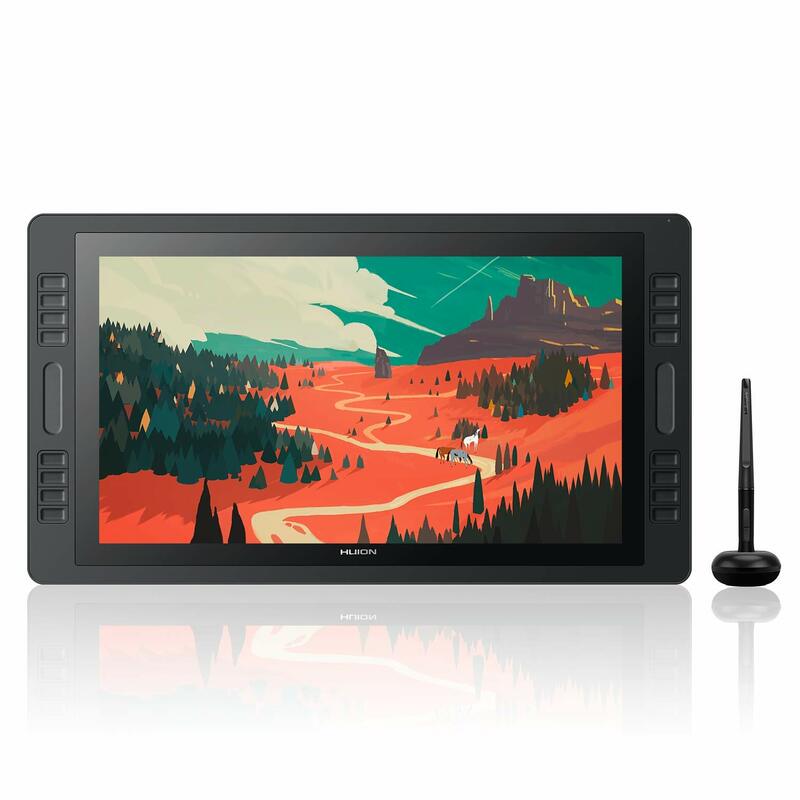 If you ask me why not use Wacom product, well, if they have 18” Cintiq within my budget I will consider it. Now the newest Cintiq is 16” which is smaller to my needs while the 22” is way to big. If Wacom could make something from 18” to 19” that would be great. PS: Huion should improve their customer service, really, I mean when I contact them about this issue the only suggestion they gave is unplugging and plugging the cord. Plus, “we never heard about this issue before”. Yes, now I’m saying there is an issue with the screen and battery free pen. Please.